Yep, somebody is gonna get fired over this. Anytime you combine explosives and something that stands 275-feet in the air, you get my attention. If you have never been to see a building get demolished by explosives, you are missing some fun. We went to watch a bank get blown up downtown when I was a kid. Some idiot forgot that while the debris would fall straight down, the fracking cloud of dirt and smoke might just bellow out a bit. They had us all back about three blocks and I coughed for two days after sucking up enough dust to be mistaken for a vacuum. There were some undies obliterated in Springfield, Ohio this week. 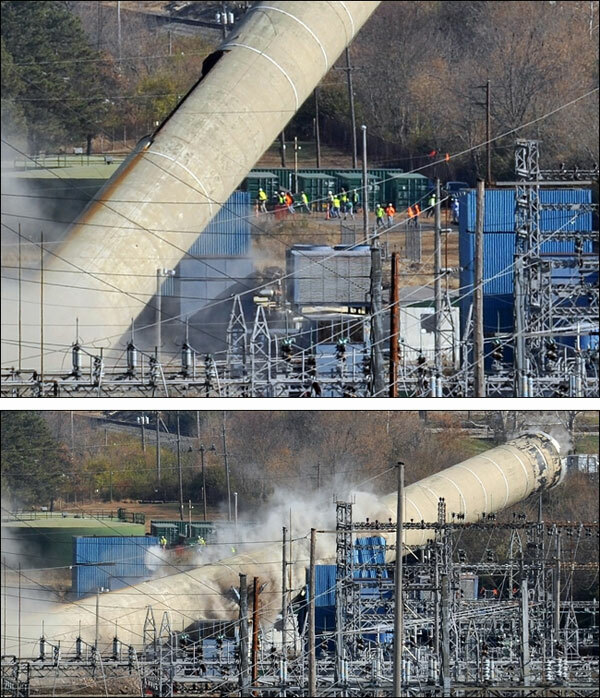 A demolition company had set up some charges around the base of a 275-foot tall smoke stack at the former Ohio Edison Mad River Power Plant. I’m no demolition expert, but everything I have seen of blowing stuff up the charged go off really quickly. It appears one in this case took longer than the others did and when it finally went off, the tower fell THE WRONG WAY. If you have ever wondered what “screaming like a bunch of little girls” really sounds like, watch the video. The tower fell on the power station next to it and left some 8000 homes with no power. D’oh. At least no one was hurt.